Orchard Grass will satisfy any sweet tooth. It is a high fiber, low protein grass hay with a sweet smell. This grass hay makes a perfect addition to your herbivore's daily diet. 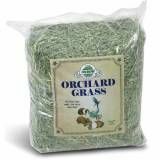 Oxbow - Orchard Grass - 15 oz product is categorised under Wholesale Oxbow Company products, Wholesale Small Animal Products, Wholesale General, Wholesale Food & Treats.